Click here for a non-annotated version. This movie zooms into the base of the heart-shaped feature on Pluto to highlight a new image captured by NASA's New Horizons. The new image, seen in black and white against a previously released color image of Pluto, shows a mountain range with peaks jutting as high as high as 11,000 feet (3,500 meters) above the surface of the icy body. Icy mountains on Pluto and a new, crisp view of its largest moon, Charon, are among the several discoveries announced Wednesday by the NASA's New Horizons team, just one day after the spacecraft's first ever Pluto flyby. "Pluto New Horizons is a true mission of exploration showing us why basic scientific research is so important," said John Grunsfeld, associate administrator for NASA's Science Mission Directorate in Washington. "The mission has had nine years to build expectations about what we would see during closest approach to Pluto and Charon. Today, we get the first sampling of the scientific treasure collected during those critical moments, and I can tell you it dramatically surpasses those high expectations." "Home run!" said Alan Stern, principal investigator for New Horizons at the Southwest Research Institute (SwRI) in Boulder, Colorado. "New Horizons is returning amazing results already. 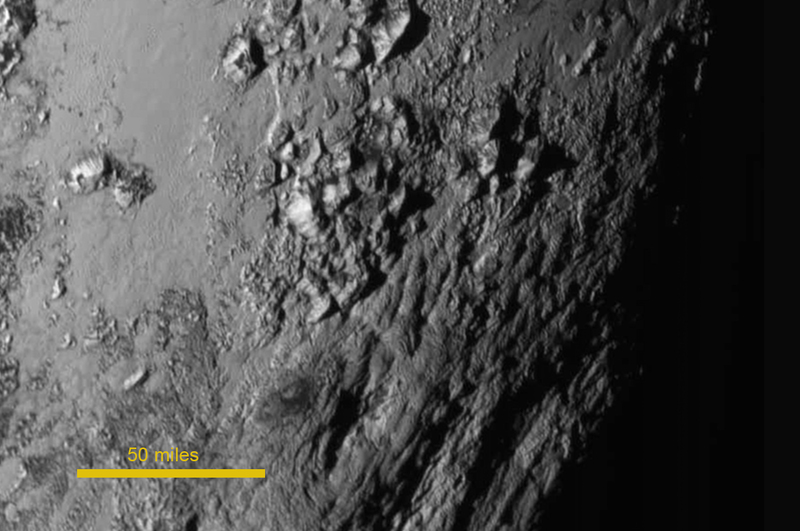 The data look absolutely gorgeous, and Pluto and Charon are just mind blowing." A new close-up image of an equatorial region near the base of Pluto's bright heart-shaped feature shows a mountain range with peaks jutting as high as 11,000 feet (3,500 meters) above the surface of the icy body. The mountains on Pluto likely formed no more than 100 million years ago -- mere youngsters in a 4.56-billion-year-old solar system. This suggests the close-up region, which covers about one percent of Pluto's surface, may still be geologically active today. "This is one of the youngest surfaces we've ever seen in the solar system," said Jeff Moore of the New Horizons Geology, Geophysics and Imaging Team (GGI) at NASA's Ames Research Center in Moffett Field, California. "This may cause us to rethink what powers geological activity on many other icy worlds," says GGI deputy team leader John Spencer, SwRI. 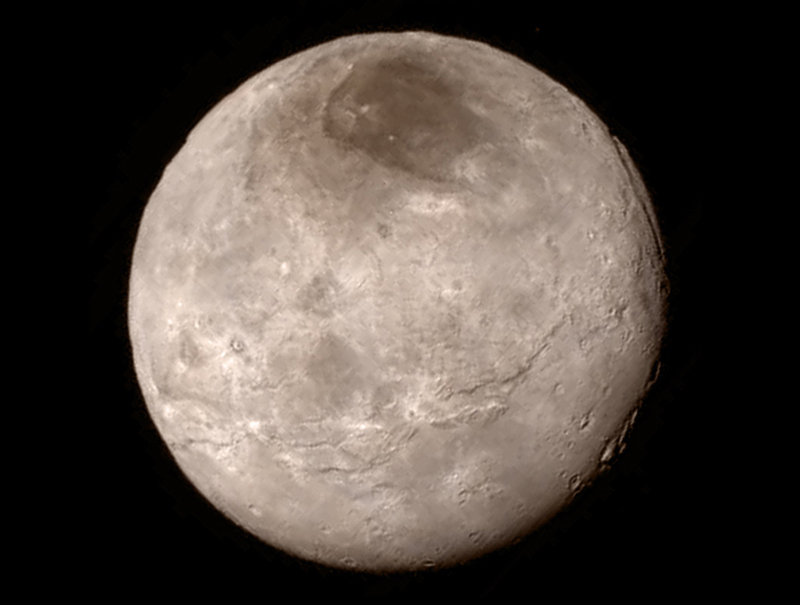 The new view of Charon reveals a youthful and varied terrain. Scientists are surprised by the apparent lack of craters. A swath of cliffs and troughs stretching about 600 miles (1,000 kilometers) suggests widespread fracturing of Charon's crust, likely the result of internal geological processes. The image also shows a canyon estimated to be 4 to 6 miles (7 to 9 kilometers) deep. In Charon's north polar region, the dark surface markings have a diffuse boundary, suggesting a thin deposit or stain on the surface. 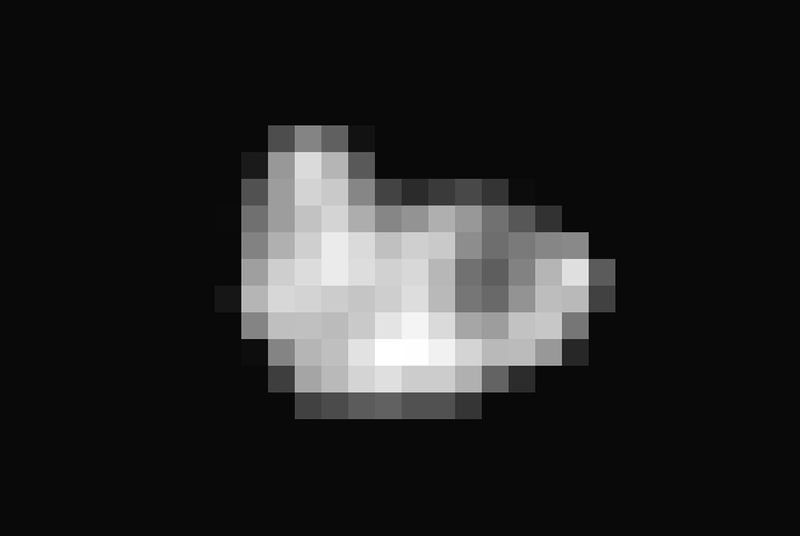 The observations also indicate Hydra's surface is probably coated with water ice. Future images will reveal more clues about the formation of this and the other moon billions of years ago. 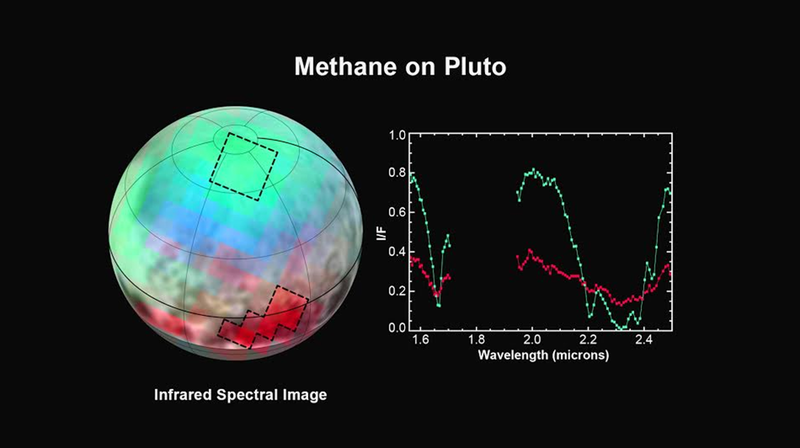 Spectroscopic data from New Horizons' Ralph instruments reveal an abundance of methane ice, but with striking differences among regions across the frozen surface of Pluto. The Johns Hopkins University Applied Physics Laboratory in Laurel, Maryland designed, built and operates the New Horizons spacecraft and manages the mission for NASA's Science Mission Directorate. SwRI leads the mission, science team, payload operations and encounter science planning. New Horizons is part of NASA's New Frontiers Program, managed by the agency's Marshall Space Flight Center in Huntsville, Alabama. Follow the New Horizons mission on Twitter and use the hashtag #PlutoFlyby to join the conversation. Live updates also will be available on the mission Facebook page.